Chronic heart failure (HF), the leading diagnosis at hospital discharge for elderly patients in Europe and the USA, carries a high mortality risk. Before the 1990’s HF was considered to be only 30 to 40% of patients admitted to hospital with a diagnosis of HF would be alive at 5 years of follow up. Moreover, recurrent hospital admission with worsening symptoms was frequent and leading to a hospitalization ‘epidemic’ in many countries1,2. Current therapeutic strategies have improved clinical outcomes, with a relative reduction in hospitalization in recent years of 30–50%. Mortality reduction, however, has been modest. 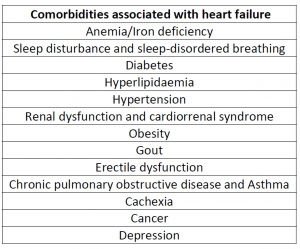 Comorbidities are frequent in patients with HF and may have an impact on clinical outcomes and response to treatment. There therefore is growing interest in understanding whether addressing the wide range of comorbidities that accompany HF (Table), could improve clinical outcomes. Results of recent studies –mainly those related to treatment of iron deficiency and sleep breathing disorders have triggered a debate regarding whether management of these comorbidities can improve prognosis in HF. The use and modality of iron therapy to treat iron deficiency in patients with HF has received relatively little attention compared with the wider topic of anaemia management in HF. Iron deficiency affects up to 50% of HF patients, and is associated with poor quality of life, impaired exercise tolerance, and increased mortality. The European Society of Cardiology Guidelines for HF (2012) recommend a diagnostic work-up for iron deficiency in patients with suspected HF but strong evidence for improved clinical outcomes with the administration oral iron is lacking. However, improvements in exercise capacity, left ventricular function, symptoms and quality of life were recently reported with the intravenous administration of ferric carboxymaltose in patients with HF in the double-blind, placebo-controlled FAIR-HF3 and CONFIRM-HF4 trials. Intravenous iron therapy may be better tolerated than oral iron, although confirmation in longer clinical trials is awaited. The placebo-controlled IRONOUT study (NCT02188784) is currently underway to assess whether treatment with oral iron polysaccharide therapy can improve functional capacity in iron-deficient patients with HF. Sleep-breathing disorders are a frequent comorbidity in HF patients and has been linked to impaired survival rates. At least 45% of patients with stable HF and left ventricular systolic dysfunction show sleep breathing disorders with an apnoea-hypopnoea index of ≥ 10 per hour, and 40 to 80% have an apnoea-hypopnoea index ≥ 15 per hour. Overnight application of a nasal CPAP device has been shown to improve central sleep apnoea in 43% of the subjects with HF5. However, several “negative” studies have also been reported 6-8. Of interest, the results of SERVE-HF9 trial showed that, in HF patients with reduced ejection fraction and central sleep apnea, both all-cause mortality and cardiovascular mortality improved in patients receiving treatment with adaptive pressure support servoventilation. The adaptive pressure support servoventilation device provides variable amounts of ventilatory support during different phases of periodic breathing and may be particularly helpful in HF patients who are nonresponsive to or noncompliant with CPAP. Stewart S, MacIntyre K, Hole DJ, Capewell S, McMurray JJ. More ‘malignant’ than cancer? Five-year survival following a first admission for heart failure. Eur J Heart Fail 2001;3:315–322. Jhund PS, Macintyre K, Simpson CR, Lewsey JD, Stewart S, Redpath A, Chalmers JW, Capewell S, McMurray JJ. Long-term trends in first hospitalization for heart failure and subsequent survival between 1986 and 2003: a population study of 5.1 million people. Circulation 2009;119:515–523. Ponikowski P, van Veldhuisen DJ, Comin-Colet J, Ertl G, Komajda M, Mareev V, McDonagh T, Parkhomenko A, Tavazzi L, Levesque V, Mori C, Roubert B, Filippatos G, Ruschitzka F, Anker SD; for the CONFIRM-HF Investigators. Beneficial effects of long-term intravenous iron therapy with ferric carboxymaltose in patients with symptomatic heart failure and iron deficiency. Eur Heart J 2014;pii:ehu385 [Epub ahead of print]. Cowie MR, Woehrle H, Wegscheider K, Angermann C, d’Ortho MP, Erdmann E, et al. Adaptive Servo-Ventilation for Central Sleep Apnea in Systolic Heart Failure. N Engl J Med. 2015;373(12):1095-105. In this issue of cardio note, Dr. Carro Hevia focuses on the role of comorbidities in patients with HF. The author should be congratulated for addressing a very important issue. Indeed, multiple non-cardiac conditions, including obesity, cachexia, cancer and depression, are common in HF and evidence now exists that they might impact clinical outcomes of patients. Among others, novel data highlight the role of iron deficiency and sleep breathing disorders. Since the pivotal work of Anker et al., it is now clear that iron deficiency occurs in many patients with HF and that iron supplementation has the potential to improve their clinical and functional status. Although it remains unclear if iron therapy has favourable prognostic effects as well, physicians should be encouraged to pay attention to this serious but treatable comorbidity in HF. Similarly, since recent publication of the results of the SERVE-HF trial, sleep-breathing disorders in HF patients are now receiving much attention. As a matter of fact, as compared with pioneer experiences with first-generation respiratory equipments, newer adaptive pressure support servoventilation devices are now able to improve breathing significantly in patients with HF and therefore their use should now on be considered mandatory when nasal CPAP devices fail to improve sleep disorders. The prevalence of HF is becoming pandemic. HF is a complex clinical syndrome characterized by signs and symptoms of abnormal cardiac function. Cardiac and noncardiac comorbidities often complicate HF care and lead to increased both mortality and hospitalization rates, especially in the elderly. Iron deficiency is associated with poor clinical outcome in HF. However, iron deficiency is not routinely assessed or treated in everyday clinical practice involving patients with symptomatic HF with reduced ejection fraction. In patients with HF -regardless of the presence or absence of an anaemic state- iron deficiency requires consideration for intravenous iron therapy. Curent evidence suggests that treatment of iron deficiency can improve clinical outcomes. The CONFIRM-HF study showed that treatment of symptomatic, iron-deficient HF patients with FCM over a 1-year period was safe and resulted in sustainable improvement in functional capacity, symptoms, and QoL in HF patients and may be also associated with risk reduction of hospitalization for worsening HF (ClinicalTrials.gov number NCT01453608) (1). Larger studies, however, are needed to further prove the role of iron therapy to improve harder end-points in HF. Sleep‐breathing disorders are often associated with HF. Obstructive sleep apnoea (OSA) is considered to represent a cause of HF, whereas central sleep apnoea (CSA) might be considered to be a compensatory response to HF. Continuous positive airway pressure (CPAP) has been proven as the standard treatment of OSA in HF. Unfortunately, there is no optimal treatment for CSA in HF at this point in time, albeit CPAP can be considered to be an adjunctive therapy. Adaptive servo controlled ventilatory support, a more recently proposed variety of CPAP, has not been, as yet, fully proven to represent an effective treatment for CSA in HF. Indeed, additional evidence is required before these treatments can be considered for routine management of HF in everyday clinical practice. Ponikowski P et al. Eur Heart J 2015;36:657-68. doi: 10.1093/eurheartj/ehu385. Epub 2014 Aug 31. Class D patients require frequent hospitalization2, which represent 60% of the health spending for the disease. Effective strategies are therefore needed for a better control of the disease in these patients and to avoid frequent re-hospitalization. Health education for both the patient and the caregivers regarding healthy lifestyle, control of risk factors and the early detection of signs of decompensation. Evidence based medical treatment in accordance to International clinical practice guidelines3. Coordinated actions among the different sectors of the health system (HF consultants and nurse specialists, primary care physicians and community nurses). Co-morbidities are certainly very important, but physicians should be aware that not all suggested new measures are fully proven and/or endorsed by guidelines. For example, the use of servo ventilation in patients with systolic HF and central apnoea, as suggested by the SERVE-HF study4, appears to result in increased mortality. Symptomatic treatment may not be effective and may even be counterproductive at times when specific symptoms represent potentially beneficial compensating mechanisms. Iron deficiency, but not anaemia, appears to be a significant problem in patients with HF. Current evidence suggests that effective management of iron deficiency in patients with HF improves quality of life, functional capacity and reduces hospitalization rates. Although no studies have been as yet carried out to assess the effects of treatment on hard end points, i.e. patient survival, current knowledge seems to indicate that patients who meet the criteria used in the CONFIRM-HF study5 should benefit from intravenous treatment with iron, in the form of ferric carboxymaltose. Hunt S, Abraham WT, Chin MH et al. 2009 Focused Update Incorporated Into the ACC/AHA 2005 Guidelines for the Diagnosis and Management of Heart Failure in Adults. doi:10.1016/j.jacc.2008.11.013. J Am Coll Cardiol. 2009; 53: e1-90. Informe RECALCAR 2015. Sociedad Española de Cardiología. http://www.recalcar.es/images/Informes_con_Logotipo/RECALCAR_INFORME_2015CL.pdf. Ponikowski P,van Veldhuisen J, Comin-Colet j et al. Beneficial effects of long-term intravenous iron therapy with ferric carboxymaltose in patients with symptomatic heart failure and iron deficiency. DOI: 10.1093/eurheartj/ehu385. Eur Heart J 2015; 36: 657-668.